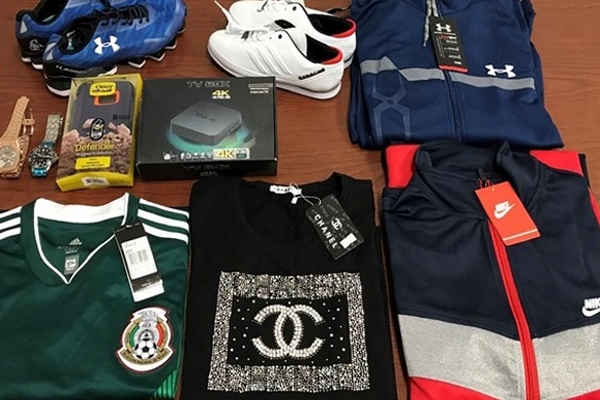 Agents with US Immigration and Customs Enforcement seized nearly 79,000 counterfeit clothing and consumer electronics in Laredo, Texas. The haul included knock-offs of brands such as Hermes, Louis Vuitton, Adidas, Nike, Apple, Samsung and Sony, and ICE’s Homeland Security Investigations (HSI) estimates the value of the seized items at more than $16m. That would make it the agency’s second-largest counterfeit seizure in Laredo. The seizure is being investigated with assistance from Customs and Border Protection (CBP), Mexican Customs and representatives from industry. During the operation, HSI special agents conducted surveillance of a public storage facility in Laredo and observed several individuals transferring boxes from a leased storage unit to pickup trucks and vans with Mexican license plates. While agents observed the storage facility, a large air courier box truck arrived to unload suspected trademark infringed merchandise to waiting pickup trucks and vans. HSI then detained and seized 275 boxes containing 78,908 items of suspected trademark-infringed merchandise from this location. No one was arrested in connection to this seizure, and this is an ongoing investigation, according to an ICE statement. According to HSI, the trademark-infringed merchandise seized was shipped in large boxes from China to an international cargo terminal located in Laredo, Texas. The boxes were manifested to fictitious Laredo recipients and addresses. Historical information suggests that smugglers typically transport illicit goods into Mexico often fail to file required export documents through CBP’s Automated Commercial Environment, and exploit the ports of entry by clandestinely smuggling merchandise to Mexico. Once in Mexico, smugglers pay bribes to Mexican cartels who often extort Mexican regulatory and law enforcement officials so that the merchandise passes without inspection and payment of duties. Last fiscal year, HSI and CBP made more than 32,000 seizures involving counterfeit goods with an estimated value of more than $1.2bn at manufacturers’ recommended selling prices (MSRP).